Pick up in your local bookshop or get free delivery. You could use Bookindy to ensure you’re buying at the cheapest price, find books that are out of stock on Amazon and your local bookshop benefits whether you pick up or get it delivered. Questions are great, but only if you know the answers. How many local bookshops do you have signed up? You can order books from hundreds of independent bookshops in the UK. Bookindy is partnering with Hive.co.uk who have a great relationship with each bookshop and will also be the people sending out books for delivery. Is Bookindy cheaper than Amazon? Bookindy often shows that books are cheaper in independent bookshops. This is why we think adding ‘Local Bookshop’ pricing and a comparison bar to Amazon is really worth it. However, if the book is slightly pricier and you decide to buy from an independent bookshop, then you’re doing your bit and supporting local UK tax paying businesses. Can I get my books delivered for free? Yes, you can. Standard delivery is always free. Bookindy shows my nearest independent bookshop, but can I buy from another one? Bookindy will always show you your nearest bookshop to where you are but you can buy from any of the hundreds of independent bookshops on Hive.co.uk, just choose a favourite bookshop when you checkout. If books are delivered to my house, how does this benefit my local bookshop? You can specify your favourite bookshop so when you purchase a book to be delivered, they will benefit from the sale. We think picking up from the bookshop itself is more fun because they’re great places to get lost in for a while and the staff are generally very nice people. Why is buying from an independent bookshop better than Amazon? Independent bookshops are brilliant. They are now more convenient than Amazon as you can order online, pick up in the shop or get your books delivered next day to your house. They’re great places to visit, they employ local people and are a part of the community. Oh, and they pay tax in the UK, which is definitely a good thing. Does Bookindy work with eBooks? Currently it doesn’t, but this is something we will add if people want it. Let us know about this and anything else in our magical feedback form. Does Bookindy support independent bookstores in the USA? Bookindy currently supports UK independent bookshops but we’re working on updating the extension for US and other countries. Are you making bundles of cash and tracking my every move? Bookindy isn’t set up to be a megacorp. The people running this are doing it for love of independent bookshops and have ‘normal’ jobs. 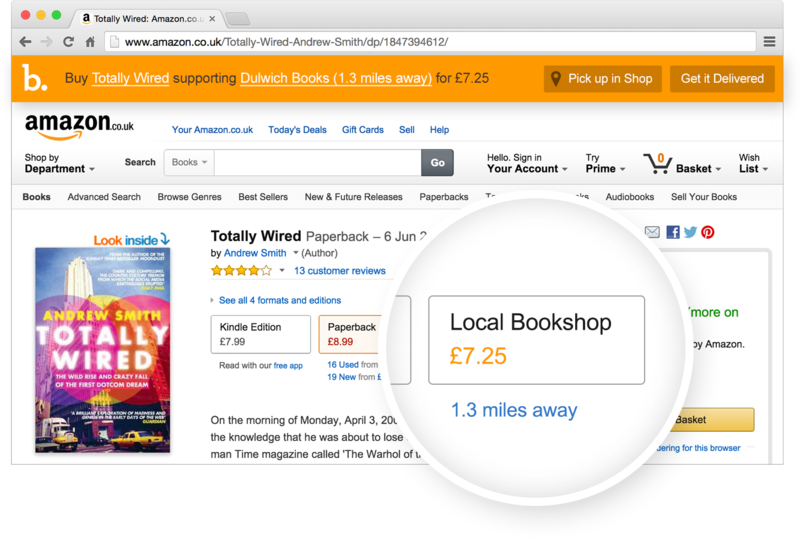 When you decide to purchase a book by clicking on the comparison bar or ‘Local Bookshop’ price box, we send you through to Hive.co.uk and by doing so we do earn some money for referrals. This helps keeps this website running and any spare money goes towards some nice google ads to get our message out. We use standard Google Analytics to monitor page views but we absolutely do not do anything crazy like tracking or selling your details to third parties. I work for Time Magazine and we want to put Bookindy on this month’s front cover, how do I get in touch? We knew it would happen. If you do want logos and sweet hi-res screenshots to go with your lovely words, please email us here and we’ll get back to you pronto. Yes, absolutely. We want to know if you love Bookindy or if you think it’s rubbish. Any feedback is great for us to improve Bookindy so please do take a couple of minutes to fill out our magical feedback form. If you prefer please email us here.